It's never as easy as the numbers. This morning I was surfing around Facebook and I came across a couple of items regarding violence and the police. No doubt it's a hot topic because of the police shootings in Dallas. First I found this picture and there's a couple of problems with it. Firstly, the comment added at the bottom of the image, as a commenter pointed out, doesn't take into account the population percentages. Because non-Hispanic whites represent 62.6% of the population they apparently should account for roughly that percentage in the statistic above. They actually account for 51.75% of the cases where the race was reported (including the unreported race in the denominator is misleading and I have excluded it from consideration. They could be all white, all African-American or all Asian for example - we don't know). The comment too is overly simplistic. African-Americans are over-represented in the killings by police. However, they are also over-represented in violent crimes committed, accounting for 28% of all violent crimes and 49% of all murders. Given that increased rate of violent activity it makes sense that African-Americans are over-represented in the police killings category, not necessarily because of police intent but because they could have been killed in the process of committing a violent act. From the overly simplistic graphic above it is impossible to tell if there is a systemic bias of some kind. Furthermore, the source of that variance in rates of violent crimes is in itself a topic for debate. Is it born of poverty and desperation? And is that poverty a result of the disproportionate single mother households in the African American community? Is it a racial bias on the part of African Americans that causes them to be disproportionately violent towards other races? A chart on CNN is grossly misleading. What is also missing is the reverse statistic regarding how many police were killed in the line of duty. The video below is also from 2014. Not only were 108 police killed in the line of duty, how many attempted assaults or murders of police were also committed? The video below is a reminder of the dangers that police officers face daily. It is easy to see why, despite the overwhelming restraint police show given how many millions of incidents occur without negative consequences, that there are situations that escalate, and that mistakes can happen. That is not to say that individual officers cannot be racist, some surely are, just as within any other population. 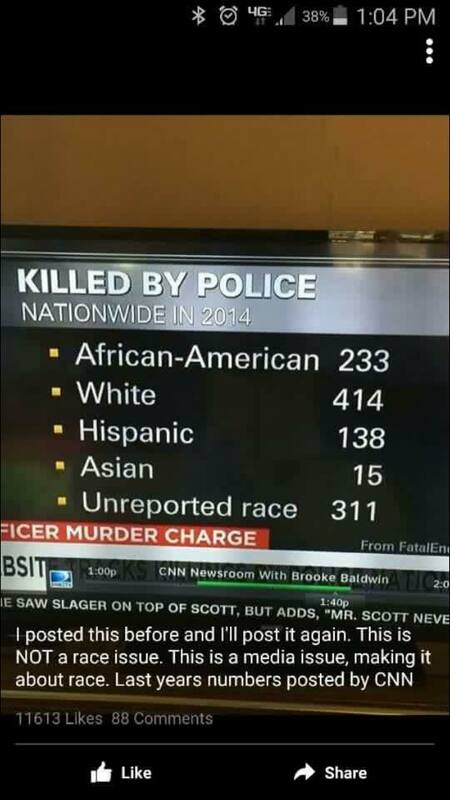 But to credit all police killings to race is not only overly simplistic, it's intentionally misleading. Watch the video below and tell me you would not also be extra cautious and perhaps a bit quick to react if you were a police officer. We ask them to protect us and to sometimes put themselves in harms way to do so. To expect perfection is unreasonable, and still the vast majority day in and day out perform remarkably close to that level and deserve our respect. As I stated in my post title, it's never as easy as the numbers. I say that as a numbers guy who thinks that numbers don't lie. Benjamin Disraeli originally said "There are three kinds of lies: lies, damned lies, and statistics." Statistics are a great tool for understanding things, but dangerous when used incorrectly. It's not the numbers that are the problem, it's how the numbers get used that is the problem. It's kind of like the same notion as guns don't kill people, people kill people. Part 2 will follow on Monday.